John Deere pencil, hand carved, 1″ in cross section x 11 1/2″ long. It has a tractor pulling a hay wagon across the field, relief carved on one side. 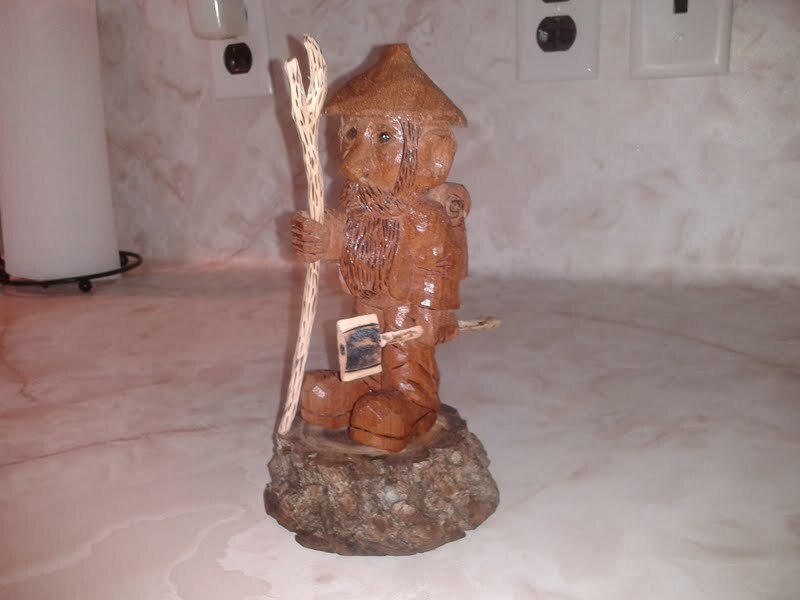 This was carved for my dad. Dad named him Jet Jackson. Not sure why, dad has a way coming up with ideas that will make you wonder. Dad is a charactor, he has a terrific sense of humor. Dad was a carpenter duriing his working days and could do wonders with wood. So many stories to tell about those occasions when we did things together. I will cherish those memories forever. Dad is very sick these days, he is my hero. 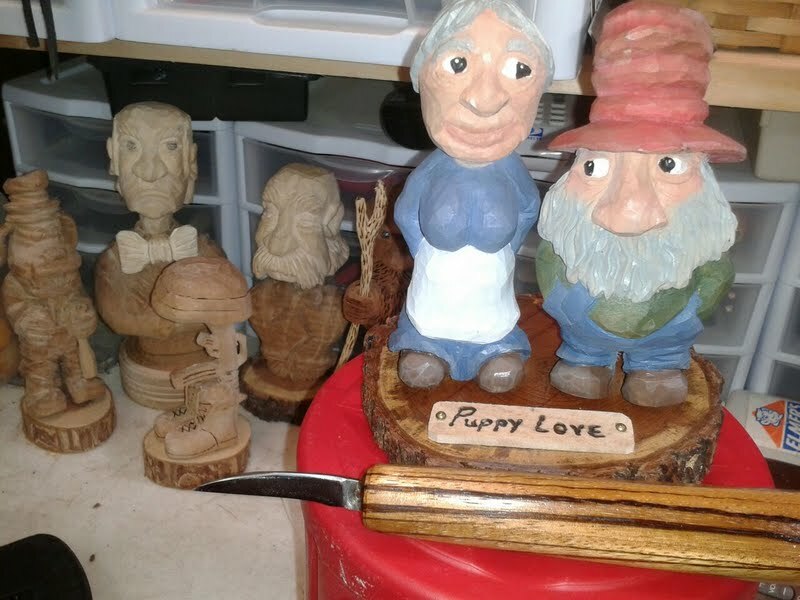 Dad passed 6-18-2014, this carving went with him. The figure is carved from butternut, the hat basswood, the scooter is cherry, the trailer is mahogany. The wheel all turn and made of birch. 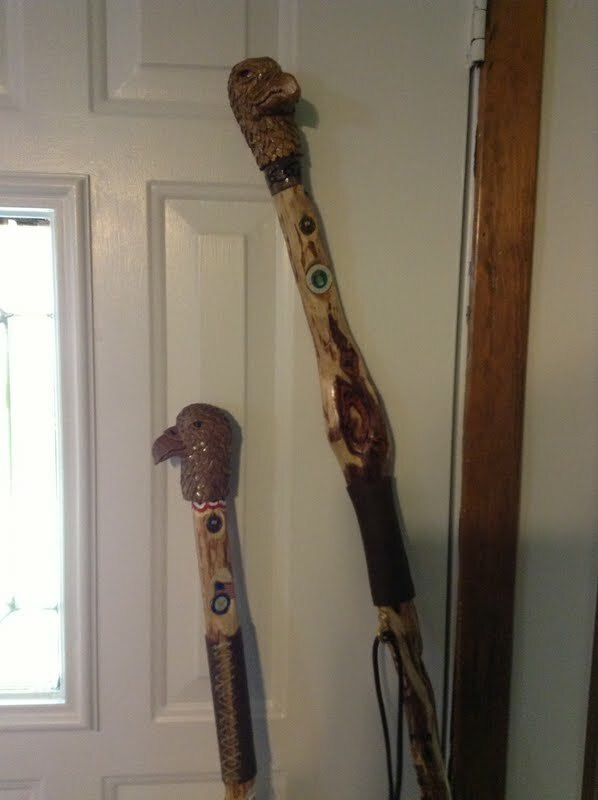 This is a very unique cane. It is a twisted vine that I found in the Texas hill country wood over 25 years ago. At the time I found this it was flimsy and not suitable for much of anything. Over the years, it had dried out and become extremely rigid. 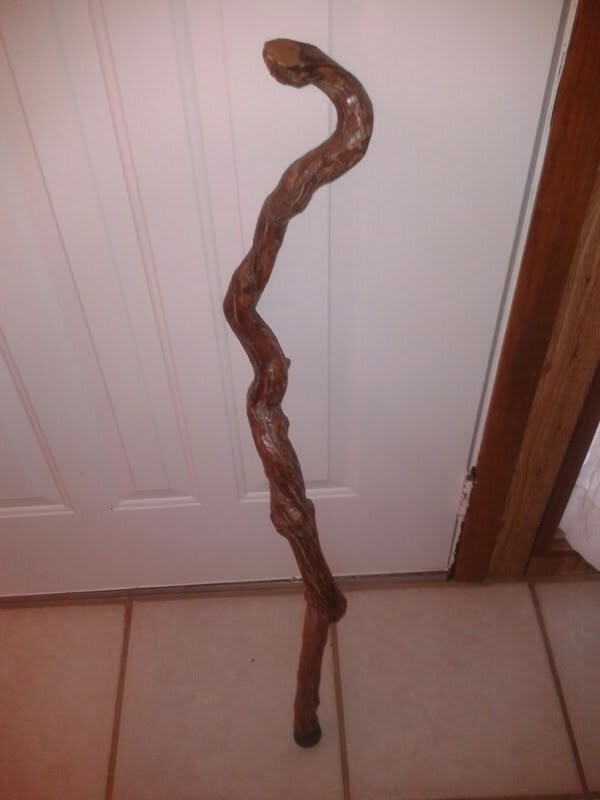 The bark is still intact and I have since cleaned up the handle area to make it comfortable to use as a cane. 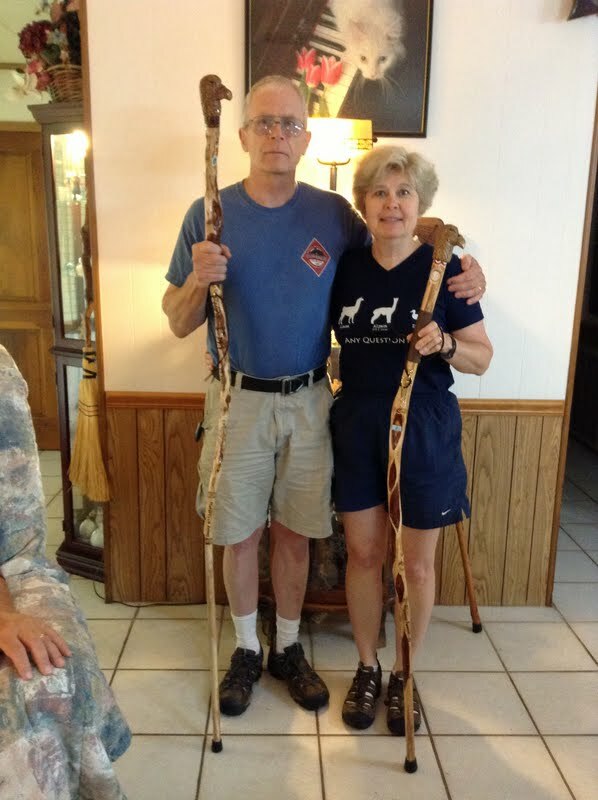 The cane has been coated with polyurethane and has a rubber tip on the bottom to aid in walking. 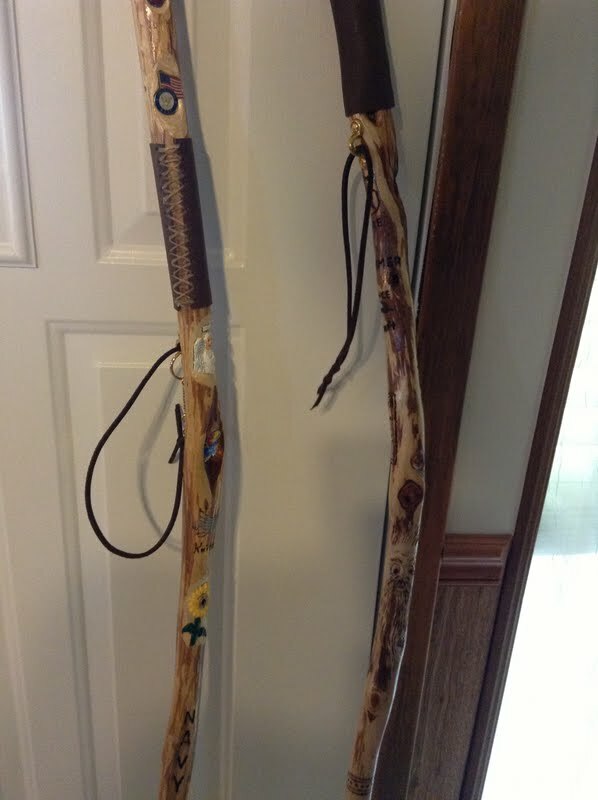 It ranges around 1-1/4″ to 1-1/2″ diameter throughout it’s length. The length is 38-1/2″. 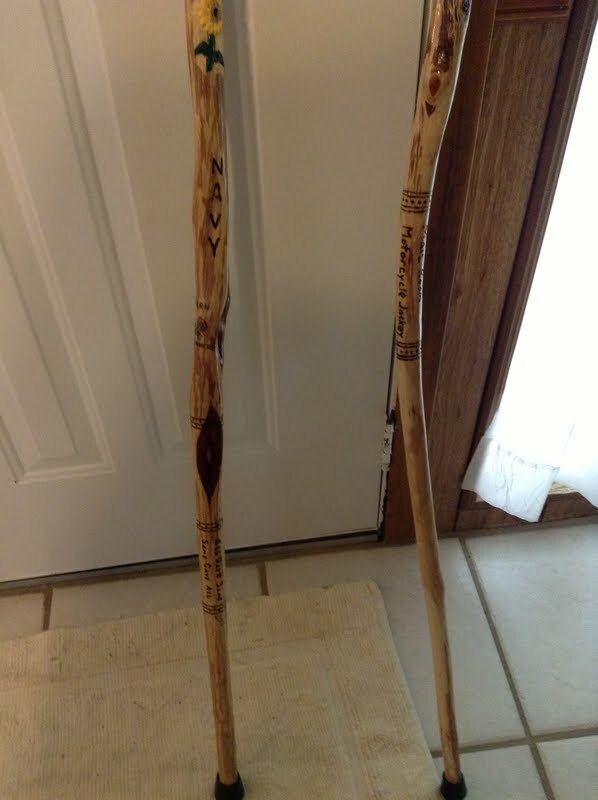 The type of wood is unknown. This is truly one of a kind. “Puppy Love” is carved from basswood about 4″ tall, painted with acrylics, mounted on a slab of mesquite, and sealed with polyurethane. Puppy Love now resides that the home of my Aunt and Uncle in Denver Colorado. “Beer Drinking Buddy” was carved for my Dad. He will be 86 this summer, best Dad ever. 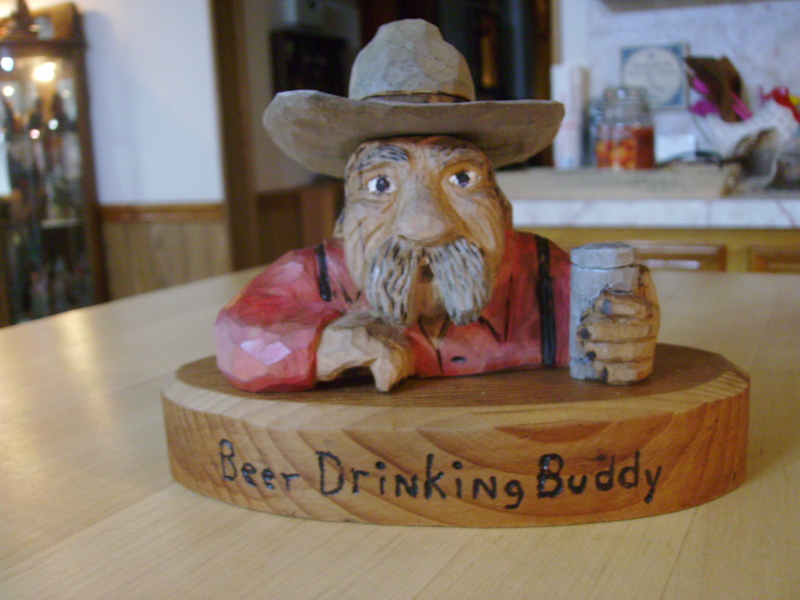 Beer Drinking Buddy was inspired by Dennis Stallings post, he stands about 4″ tall, 6″ wide and 4″ deep. He is carved from basswood, painted with acrylic paint, sealed with polyurethane and mounted on a cedar base.